Turns out there's something to it. Fortune's David Stipp recounts the amazing, real story of the scientist and startup that have a shot at making it happen. NEW YORK (Fortune) -- If you haven't heard of resveratrol, you're probably too young to have had the experience of gazing in the bathroom mirror in the morning and thinking, "damn." Resveratrol is the ingredient in red wine that made headlines in November when scientists demonstrated that it kept overfed mice from gaining weight, turned them into the equivalent of Olympic marathoners, and seemed to slow down their aging process. Few medical discoveries have generated so much instant buzz - even Jay Leno riffed about it in his opening monologue. Christoph Westphal, who earned a Ph.D and an MD from Harvard in less than six years, gave up a lucrative career as a biotech VC to launch Sirtis. David Sinclair at the lab. 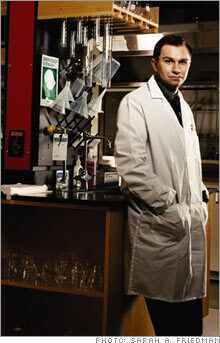 Sirtis is making a major bet that his theory of how resveratrol works is right. But the key question raised by the news - whether the discoveries will lead to pharmaceutical payoffs before we're too old to care - won't be answered in the Harvard lab from which the news sprang. Instead look to a boxy, low-rise building a couple of miles away, an unprepossessing biotech hatchery that got little media attention in the wake of the resveratrol findings. This is the Cambridge home of two-year-old Sirtris Pharmaceuticals. Its stated goal is to develop medicines that have the same health-boosting effects in people that resveratrol had on mice. But that hardly captures the company's sweeping promise: if it succeeds, its medicines may retard the onset or progression of a whole slew of age-related diseases, from diabetes to Alzheimer's to cancer. The drugs may also have an extremely provocative side effect: They might extend life span. You have to go back to the advent of antibiotics in the first half of the 20th century to find such broad therapeutic potential. For all that to happen, Sirtris, like most biotech startups, must wend through a minefield that will take many years to traverse. And no biotech gets very far through the minefield without a kind of walking contradiction leading the way - a dreamer with feet planted firmly on the ground, a science whiz who could pass as a circus ringmaster, a riverboat gambler with a passion for minimizing risk. Three years ago one such paradox strolled into the Harvard lab that put resveratrol on the map and set in motion events that may in time radically transform the way we age: meet Christoph Westphal, Sirtris's co-founder, CEO, and dreamer-in-chief. A former venture capitalist, Westphal, 38, was known for conjuring up dreams that spellbind investors before he joined forces with David Sinclair, 37, the charismatic Harvard medical school researcher who spearheaded the research on resveratrol. Between 2000 and 2004, Westphal co-founded five companies and served as CEO of four of them, including two hot biotechs that have gone public and now have a combined market value of over $1.4 billion. 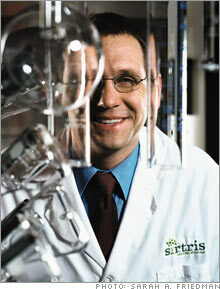 But Sirtris is probably his entrepreneurial pi�ce de r�sistance, and he quit his meteoric VC career to lead it. MIT professor Phillip Sharp, a Nobel laureate biologist who advises Sirtris and has known Westphal for years, says he's excited about the startup's science. But it was Westphal's involvement that largely persuaded him to put his imprimatur on Sirtris. (Sharp, one of the biggest names in science, helped launch the biotech industry in 1978 by co-founding Biogen, now Biogen Idec (Charts).) "Christoph's combination of skills is very rare," Sharp says. "I haven't seen his equivalent in 30 years of working in biotech." Venture capitalists have been equally enthralled by Westphal, judging by the $82 million they've pumped into closely held Sirtris over the past two years. That's a remarkably large sum for a high-risk, early stage biotech, and it has helped fast-track the company's drug development - it is already clinically testing its first medicine, a resveratrol-based drug that promises to help keep diabetic patients' blood sugar under control. The drug contains concentrated resveratrol and gets far more of it into the bloodstream than drinking red wine can. Most biotechs pioneering new science take years before testing drugs on people; Sirtris's drug reached the clinic less than 18 months after the company's launch. For all his mastery at raising money, Westphal isn't your standard-issue CEO. His lead haberdasher is probably Levi Strauss & Co. his cramped, sparsely furnished office, which is shared with Sinclair when the Harvard scientist drops by, is not much bigger than a walk-in closet. And because he doesn't like cluttering his life with things like cars, he often walks five or more miles a day getting to work and meetings. A husky 6-foot 3-inch man with an edgy, no-nonsense air, Westphal doesn't so much ambulate as lunge - his body language suggests a star halfback who has just spotted a football spiraling down about five yards ahead of his pigskin-eager hands. His colleagues are accustomed to his daily barrage of e-mails, which begins around 5:30 a.m. "I must get 50 e-mails a day from him," says Boston hedge fund manager Richard Aldrich, one of Sirtris's founding investors. "He probably over communicates." (Westphal says that over communication is a nonissue because "nobody reads my e-mails.") In fact, just about the only time anyone can recall the boss giving his blackberry a breather was during a few startling minutes last November. It turned out that he had laid it aside for a few minutes to deliver a baby -- his own son. In fact, Westphal delivered all three of his children at a Boston hospital under an obstetrician's supervision. At first glance, Westphal's frenetic personal style resembles attention deficit disorder. But in his case it's probably better described as bandwidth-coming-out-of-the-ears syndrome. When I interviewed him some months ago at Sirtris, for instance, he couldn't resist assembling a new sound system for his office as we talked. He managed to read the instructions, examine the pieces, and put them together without missing a beat in the conversation. A few other r�sum� bullet points: Westphal plays the cello; speaks four languages (his kids speak only German with him and Spanish with his Puerto Rican wife); and has visited two-thirds of the countries on earth. He's also a disarming extrovert who genially crushes competitors into the dust. When Sirtris held a companywide weight-loss contest over last summer and fall, no one was very surprised when Westphal's team won. On the weekend before the final weigh-in, the CEO starved himself and exercised all-out twice a day, pushing so hard that his wife feared he might have a heart attack. "When you get involved with Christoph," says Aldrich, " it's all action, all the time." It won't come as a surprise that Westphal's powers of concentration appeared early. As a youngster he told his parents, physicians who grew up in Germany and moved to the U.S. in 1967 (young Christoph grew up in the Washington, D.C., area), that he wasn't very interested in following in their professional footsteps. "Of course you'll get an MD," his mother replied. "Then you can decide what you want to do." Rebelling in the way of a good German son, he got a Ph.D. in biology and slogged through an MD on the side - both from Harvard in five years and eight months, nearly a record. After that he worked at a hospital in equatorial Africa, where he delivered scores of babies. Then he decided that what he really wanted to do was start companies that turn basic research into drugs. That led to his furiously productive stint as a venture capitalist.